At Method, we give small businesses a customized solution fit just for their work. But we understand that a ‘made-for-me’ solution goes beyond customizing your Method account. So, we have split up our core Contact Management pack into smaller, more role-relevant packs. Method is simplifying our packs to ensure our customers use and pay only for what they need. The new packs make it easier to give your employees the tools and access they need within Method. 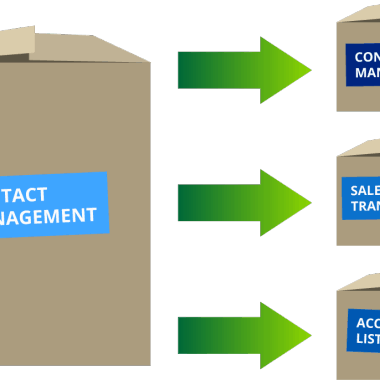 The biggest change is our Contact Management pack, which has been split into three more focused packs: Contact Management, Sales Transactions, and Accounting Lists. You’ll see the changes to our packs on the Subscription and Marketplace screens. Nothing. Your account will be updated. However, since the new packs give each of your employees exactly what they need, it’s a great time to introduce more of your team to Method. For example, if you want your Sales Rep to stop tracking their leads in spreadsheets, add them as a user in Method with only the Contact Management and the Sales Pipeline packs. They can focus on managing their pipeline and winning new business, while Method keeps everything organized. And as the business owner, you’ll have insight into your team’s performance through the use of a single, centralized system. More team members working in a single system like Method means fewer errors and no double data entry. The end result is an increase in efficiency across your team.